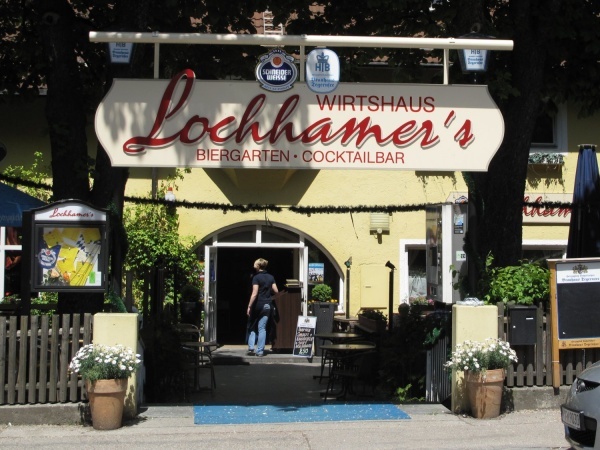 Lochhamer's beer garden is located directly at the river Würm in Gräfeling, directly at the city boundary of Munich. This small, charming and rarely crowded beer garden is shaded by many large chestnut trees. The beer garden has 500 seats with some of the tables in the self-service directly by the waterfront. A water wheel and the model train which runs along the railing at the water edge are entertaining not only for kids. The beer is from the Tegernseer brewery and a Maß of Tegernseer Hell (lager) costs € 7.30 (June 2017). The food stall in the self service area has a selection of reasonable priced Bavarian meals and snacks. The start of a very nice city park located along the Würm is just across the road. The beer garden is open daily from 10am until 11pm.